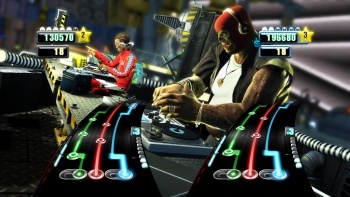 Activision has revealed the full list of 93 songs aspiring DJs will be able to mix and scratch their way through when DJ Hero hits shelves later this month. The following list of 93 remixes from some pretty renowned DJs - including DJ AM, Cut Chemist, Grandmaster Flash, DJ Jazzy Jeff, J. Period, DJ Shadow and DJ Z-Trip - has a ridiculous range of styles and artists. I don't think that any previous Hero or Rock Band games have even come close to this variety: Where else are you going to find David Bowie, 50 Cent, Marvin Gaye, Foreigner and Daft Punk all in a single game? â€¢ 2Pac - "All Eyez On Me" vs. The Aranbee Pop Orchestra - "Bittersweet Symphony (Instrumental)"
â€¢ 50 Cent - "Disco Inferno" vs. David Bowie - "Let's Dance"
â€¢ 50 Cent - "Disco Inferno" vs. InDeep - "Last Night A DJ Saved My Life"
â€¢ Afrika Bambaataa - "Zulu Nation Throwdown" vs. Freedom Express - "Get Down"
â€¢ Beastie Boys - "Intergalactic" vs. Blondie - "Rapture"
â€¢ Beck - "Where It's At" vs. DJ Shadow - "Six Days (Remix ft. Mos Def)"
â€¢ Bell Biv DeVoe - "Poison" vs. Cameo - "Word Up!" â€¢ Benny Benassi - "Satisfaction" vs. TiÃ«sto - "Elements Of Life"
â€¢ Black Eyed Peas - "Boom Boom Pow" vs. Benny Benassi - "Satisfaction"
â€¢ Bobby "Blue" Bland - "Ain't No Love In The Heart Of The City" vs. 2Pac - "How Do You Want It"
â€¢ Bobby "Blue" Bland - "Ain't No Love In The Heart Of The City" vs. Connie Price & The Keystones - "Fuzz And Them"
â€¢ Chuck Brown & The Soul Searchers - "Bustin' Loose" vs. Young MC - "Bust A Move"
â€¢ Cypress Hill - "Insane In The Brain" vs. Classics IV - "Spooky"
â€¢ Cypress Hill - "Insane In The Brain" vs. David Axelrod - "The Edge"
â€¢ Daft Punk - "Around The World" vs. Young MC - "Bust A Move"
â€¢ Daft Punk - "Da Funk" vs. N.A.S.A. - "Strange Enough ft. Karen O, ODB & Fatlip"
â€¢ Daft Punk - "Megamix 1"
â€¢ Daft Punk - "Megamix 2"
â€¢ Daft Punk - "Robot Rock" vs. Queen - "We Will Rock You"
â€¢ Daft Punk - "Short Circuit" vs. Boogie Down Productions - "Jack Of Spades"
â€¢ Daft Punk - "Technologic" vs. Gary Numan - "Cars"
â€¢ Daft Punk - "Television Rules the Nation" vs. No Doubt - "Hella Good"
â€¢ David Axelrod - "The Edge" vs. Eric B. & Rakim - "Eric B. Is President"
â€¢ Dizzee Rascal - "Fix Up, Look Sharp" vs. DJ Shadow - "Organ Donor (Extended Overhaul)"
â€¢ Dizzee Rascal - "Fix Up, Look Sharp" vs. Justice - "Genesis"
â€¢ DJ Shadow - "Six Days (Remix ft. Mos Def)" vs. D-Code - "Annie's Horn"
â€¢ Eminem - "My Name Is" vs. Beck - "Loser"
â€¢ Fedde Le Grand - "Put Your Hands Up For Detroit" vs. Sandy Rivera and David Penn - "I Can't Stop (David Penn Remix)"
â€¢ Gorillaz - "Feel Good Inc." vs. Blondie - "Atomic"
â€¢ Gwen Stefani - "Hollaback Girl" vs. Gorillaz - "Feel Good Inc."
â€¢ Gwen Stefani - "Hollaback Girl" vs. Rick James - "Give It To Me"
â€¢ InDeep - "Last Night A DJ Saved My Life" vs. Cameo - "Word Up!" â€¢ Jackson 5 - "I Want You Back" vs. Third Eye Blind - "Semi-Charmed Life"
â€¢ JAY-Z feat. Pharrell - "Change Clothes" vs. 2Pac - "All Eyez on Me"
â€¢ JAY-Z - "Izzo (H.O.V.A.)" vs. Eminem - "My Name Is"
â€¢ JAY-Z - "Izzo (H.O.V.A.)" vs. Jackson 5 - "I Want You Back"
â€¢ JAY-Z - "Excuse Me Miss" vs. Rick James - "Give It To Me"
â€¢ Jean Knight - "Mr. Big Stuff" vs. Masta Ace - "Born To Roll"
â€¢ Jurassic 5 - "Jayou" vs. Billy Squier - "The Big Beat"
â€¢ Jurassic 5 - "Jayou" vs. Herbie Hancock - "Rockit"
â€¢ Kid Cudi - "Day 'N' Nite" vs. Black Eyed Peas - "Boom Boom Pow"
â€¢ Kool Moe Dee - "How Ya Like Me Now" vs. Reel 2 Real featuring The Mad Stuntman - "I Like To Move It"
â€¢ M.I.A. - "Paper Planes" vs. Wale - "Lookin' At Me"
â€¢ Marvin Gaye - "I Heard It Through The Grapevine" vs. David Bowie - "Let's Dance"
â€¢ Marvin Gaye - "I Heard It Through The Grapevine" vs. Gorillaz - "Feel Good Inc."
â€¢ N.A.S.A. - "Strange Enough ft. Karen O, ODB & Fatlip" vs. Isaac Hayes - "Theme From Shaft"
â€¢ Paul van Dyk - "Nothing But You" vs. Sandy Rivera and David Penn - "I Can't Stop (David Penn Remix)"
â€¢ Public Enemy - "Shut 'Em Down" vs. Beck - "Where It's At"
â€¢ Queen - "Another One Bites The Dust" vs. Daft Punk - "Da Funk"
â€¢ Rihanna - "Disturbia" vs. Kid Sister - "Control"
â€¢ Rihanna - "Disturbia" vs. The Trammps - "Disco Inferno"
â€¢ Shlomo - "Beats" vs. Billy Squier - "The Big Beat"
â€¢ Tears For Fears - "Shout" vs. DJ Shadow - "Six Days (Remix ft. Mos Def)"
â€¢ Tears For Fears - "Shout" vs. Eric Prydz - "Pjanoo"
â€¢ The Killers - "Somebody Told Me" vs. Eric Prydz - "Pjanoo"
â€¢ Vanilla Ice - "Ice Ice Baby" vs. MC Hammer - "U Can't Touch This"
â€¢ Vanilla Ice - "Ice Ice Baby" vs. Paula Abdul - "Straight Up"
â€¢ Wale - "Lookin' At Me" vs. Black Eyed Peas ft. Tippa Irie - "Hey Mama"
DJ Hero will be released on Xbox 360, PS3, Wii and PS2 on October 27th in North America, and October 30th in Europe. And you know what? It looks pretty cool.